This luxury beachfront villa situated just above the crystal clear Lindos Main Beach and under the Acropolis of Lindos village, Rhodes. It is a terrific spot to soak up the local atmosphere, being just 5 minutes walk from the village tavernas, bars and supermarkets. Therefore, you don't need to rent a car. This villa offers high-quality facilities and stunning views to every visitor from couples to families and older people. A two-bedroomed accommodation with a sophisticated interior design combining soft Greek island colours and natural texture. We invite you to experience a seaside retreat of boundless splendor that will inhabit your memories forever!! The villa is available for booking all year round. Please contact the owner for any help. The villa features two sea-view bedrooms, two bathrooms with rain shower, spacious fully-equipped fitted kitchen and sitting-room. High-quality facilities / Impressive view to the Aegean sea. Stunning views create an ideal setting for rest, relaxation, physical and mental recuperation. It is the first house on the left beachfront side of the village. Free of neighbouring buildings, it offers an exquisite sense of privacy. As you enter the traditional stone-curved, wooden, Lindian gate, you face a genuine pebbled courtyard. On your right hand, there are two main bedrooms with wooden ceilings; one with its own private bathroom. Lying on the Lindian beds, you can enjoy the view of the Aegean blue. On your left hand side, there is the kitchen and the sitting-room which can host two more guests. You can have a lovely dinner in the large dining-table with six wooden chairs. Through the kitchen, there is a toilet and a shower accessible to all the guests. Throughout the villa, you can have access to free wireless internet using the three flat screen tvs in all rooms. 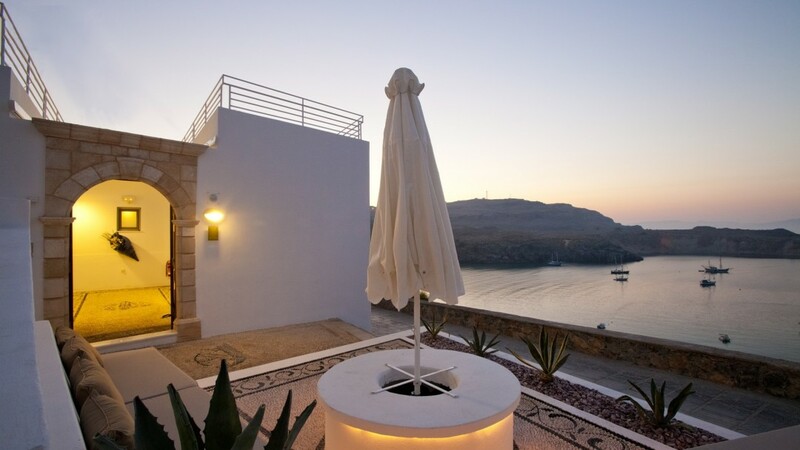 Outside the villa, there is an outdoor sitting area where you can drink and delight in the sunset or the sunrise and Lindos main harbour.